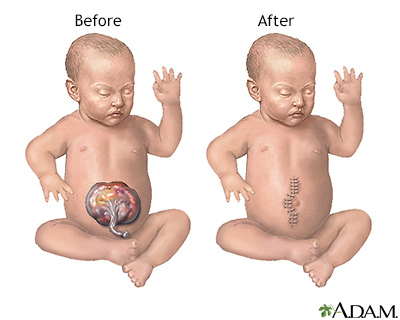 Omphalocele repair is a procedure done on an infant to correct a birth defect in the wall of the belly (abdomen) in which all or part of the small intestine, liver, and large intestine stick out of the belly button (navel) in a thin sac. Other birth defects may also be present. The goal of the procedure is to place the organs back into the baby's belly and fix the defect. Repair may be done right after the baby is born. This is called primary repair. Or, the repair is done in stages. This is called staged repair. Surgery for primary repair is most often done for a small omphalocele. Right after birth, the sac with the organs outside the belly is covered with a sterile dressing to protect it. When the doctors determine your newborn is strong enough for surgery, your baby is prepared for the operation. Your baby receives general anesthesia. This is medicine that allows your baby to sleep and be pain-free during the operation. The surgeon makes a cut (incision) to remove the sac around the organs. 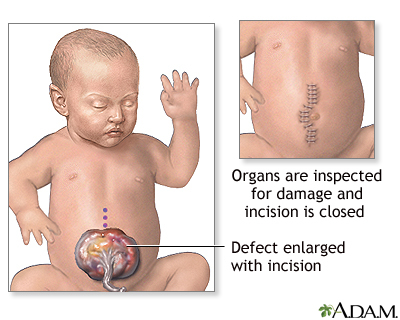 The organs are examined closely for signs of damage or other birth defects. Unhealthy parts are removed. The healthy edges are stitched together. The organs are placed back into the belly. Right after birth, a plastic pouch (called a silo) or a mesh-type of material is used to contain the omphalocele. The pouch or mesh is then attached to the baby's belly. Every 2 to 3 days, the doctor gently tightens the pouch or mesh to push the intestine into the belly. It may take up to 2 weeks or more for all of the organs to be back inside the belly. The pouch or mesh is then removed. The opening in the belly is repaired. 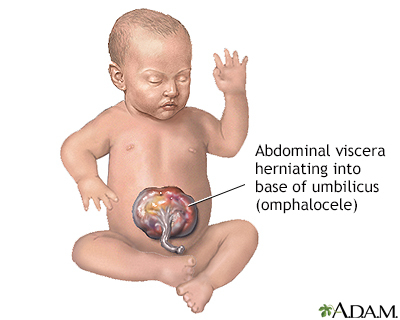 Omphalocele is a life-threatening condition. It needs to be treated soon after birth so that the baby's organs can develop and be protected in the belly. Breathing problems. The baby may need a breathing tube and breathing machine for a few days or weeks after surgery. 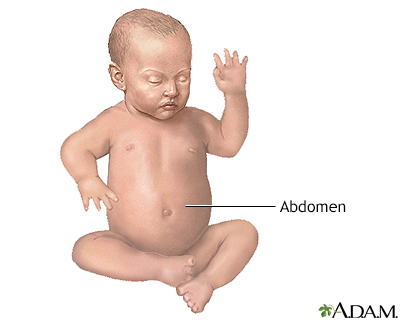 Inflammation of the tissue that lines the wall of the abdomen and covers the abdominal organs. Omphalocele is usually seen on ultrasound before the baby is born. After it is found, your baby will be followed very closely to make sure he or she is growing. Your baby should be delivered at a hospital that has a neonatal intensive care unit (NICU) and a pediatric surgeon. A NICU is set up to handle emergencies that occur at birth. A pediatric surgeon has special training in surgery for babies and children. Most babies who have omphalocele are delivered by cesarean section. After surgery, your baby will receive care in the NICU. Your baby will be placed in a special bed to keep your baby warm. Feedings are started through the NG tube as soon as your baby's bowel starts working after surgery. Feedings by mouth will start very slowly. Your baby may eat slowly and may need feeding therapy, lots of encouragement, and time to recover after a feeding. How long your baby stays in the hospital depends on whether there are other birth defects and complications. You may be able to take your baby home once he or she is taking all foods by mouth and gaining weight. Most of the time, surgery can correct omphalocele. How well your baby does depends on how much damage or loss of intestine there was, and whether your child has other birth defects. Some babies have gastroesophageal reflux after surgery. This condition causes food or stomach acid to come back up from the stomach into the esophagus. Some babies with large omphaloceles may also have small lungs and may need to use a breathing machine. All babies born with an omphalocele should have chromosome testing. This will help parents understand the risk for this disorder in future pregnancies. Islam S. Congenital abdominal wall defects. In: Holcomb GW, Murphy JP, Ostlie DJ, eds. Ashcraft's Pediatric Surgery. 6th ed. Philadelphia, PA: Elsevier Saunders; 2014:chap 48.